President Donald Trump and his administration have spent weeks claiming that the Central American migrants seeking asylum in the U.S. use an immigration policy called "catch and release" to infiltrate the country. Trump has likened it to a loophole in the law that allows unlawful immigrants who are making America less safe to stay, rather than being subject to immediate deportation. "Catch and release is ridiculous. If they touch our property, if they touch our country, essentially, you catch them and you release them into our country. That's not acceptable to anybody. We need a change in the law," Trump said Tuesday, when asked about the members of the migrant caravan waiting at the border crossing between Tijuana, Mexico, and California to plead their cases for asylum after a grueling journey to the border. But the president's characterization of "catch and release" is misleading, and while his administration vilifies asylum seekers as gang members, their own data doesn't seem to back them up. There is no law or hard and fast policy called "catch and release," as the president has claimed. The term originally became popular during the Bush administration to describe the practice of releasing immigrants from detention while they await immigration court proceedings, in part because there were not enough detention facilities to hold immigrants pending immigration court proceedings. Immigration experts say that practice is no longer common. The White House has used the term to blast the protections afforded to children and families seeking asylum in the U.S. and complain that the government can't detain asylum seekers indefinitely. The White House said in an April release that the primarily Central American families and children "have been exploiting these weaknesses in our immigration system for years in order to enter and remain in the country," and argued they dodge court dates and deportation orders. While a typical immigrant who tries to cross the border can be quickly detained and deported, vulnerable immigrants are granted special protections. That includes asylum seekers, families with children, and unaccompanied alien children (UACs), particularly those who come to the U.S. from a non-contiguous country. "The law recognizes this group as particularly vulnerable simply because they're children. 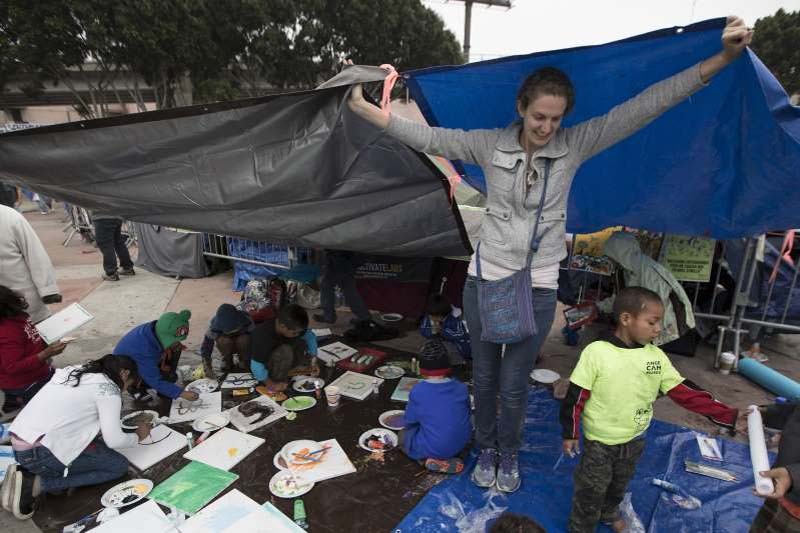 Historically, the U.S. immigration system is designed for adults, it's difficult enough for adults let alone children," said Wendy Young, the president of Kids in Need of Defense (KIND). Her organization defends UACs in court and trains other attorneys to do the same. She added: "These are not loopholes in our immigration laws, these are protections designed for children." Among those protections: different, more cautious asylum hearing proceedings for UACs, because it is thought that they are more likely to be victims of human trafficking, and limits on how long families with children can be held in detention centers. UACs are typically referred to the Office of Refugee Resettlement to be released into the custody of a relative who has been vetted by the department; families are released, as well, pending court proceedings. "That's an obligation that's derived from international law — the Refugee Convention — and a moral obligation to protect those who are fleeing violence," said Denise Gilman, a University of Texas School of Law professor. Gilman is a co-director of the school's Immigration Clinic and an immigration attorney who works with families seeking asylum. Who are the immigrants Trump says are taking advantage? Immigrants who are caught at the border and released pending further proceedings are mostly families and children seeking refuge from Central American countries with high rates of violence. "Most UACs are older teens from Central America. Some are MS-13 gang members who use our immigration system to infiltrate the country, but many other UACs are also at great risk from gang activity. Releasing UACs to sponsors with often unstable living situations makes these teens prime targets for gang recruitment and violence," the White House said in early April in a newsletter. The vast majority of UACs are 15 to 18, but very few are believed to be associated with gangs. Just 159 of the 250,000 unaccompanied minors detained at the border between over a nearly six year period were suspected or confirmed to be affiliated with gangs, according to government officials' Senate testimony last summer. Fifty-six of the 159 were suspected or confirmed to be affiliated with MS-13, or 0.02 percent of the total figure. "They are not gang members, they are kids who are fleeing gang recruitment," Young said. Advocates note that many of these children do not speak English, have experienced trauma, and lack the resources to hire attorneys. The majority of kids going through immigration court in recent years do it without an attorney, according to data compiled by Syracuse University. "In terms of families, I've worked with hundreds of families now over the last few years and in my experience the vast majority are truly fleeing horrific violence," Gilman said. Do these immigrants dodge court dates and stay in the U.S.? Yes, and no. Some people do skip court hearings: In cases that began in fiscal year 2017, 3,167 UACs were given removal orders after failing to appear at a court hearing, according to the Syracuse data. But far more show up for court. Over the last 13 years, more than twice as many cases were resolved with immigrants in court rather than in absentia, according to the Syracuse data. What's more, nearly all UACs show up when they have attorneys. Just 75 represented UACs were found in absentia, out of more than 54,036 overall cases from fiscal year 2017. Gilman said informed families are likely to show up for court hearings, and families with representation are even more likely. The Trump administration has compared the tens of thousands of asylum seekers still in the country this year to the far smaller number of those who have been removed to back up their claim that those who seek asylum are exploiting a backlogged system. But the reality is that asylum cases can take years to resolve, particularly for children: Of the 54,036 UAC cases that began in fiscal year 2017, 47,567 of those cases were still pending as of March 2018. Advocates say this doesn't change the merit of their claims. "They're seeking the rule of law," Gilman said. "They're not breaking the law [by entering the country without documentation] because that's how you seek of asylum."